Some members of the JFCY Public Legal Education (PLE) Team! 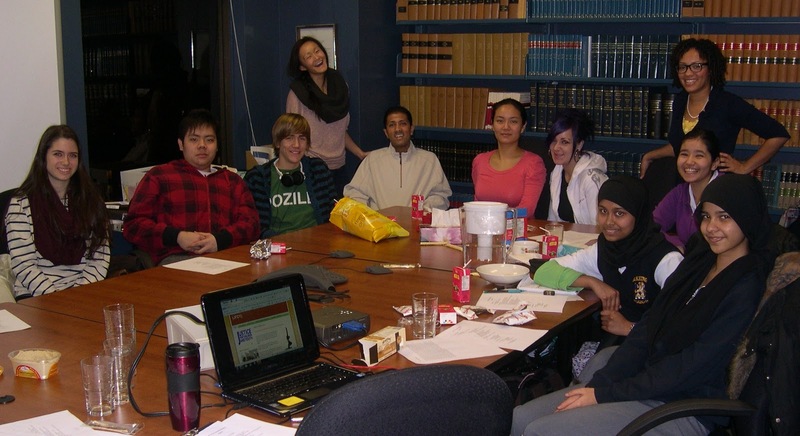 The JFCY PLE Team is composed of high school students, post-secondary students, interested members of the community and JFCY staff lawyers. Starting in September 2012, the PLE Team will be welcoming the Youth Action Committee (YAC). YAC will be acting as the youth voice on the PLE Team and will have an important and special role. The Team is creates social media communications such as YouTube videos, pamphlets, newsletters, Facebook, blogs, etc. The aim is to inform youth of their legal rights through engaging social media. Committee members have direct involvement in creating the above communications allowing members an opportunity to display creativity and new ideas! The Team meets year-round on a monthly basis usually at 5:30pm at the JFCY office. Refreshments and TTC student tickets are provided at our regular meetings. Members are expected to be working on assigned projects (blog posts, newsletter articles, etc.) on their own time. Because we are currently full, the PLE Team is only accepting youth members (under age 18, in high school). If you are over age 18 then please check back in early 2013 to see if we are accepting new members. If you are in high school and interested in joining, please send an email to Andrea at lueya@lao.on.ca. Due to limited space, we are not able to accept all volunteers who apply.